Pantu visits Mutu, head family of the community, and put mud on residents. The Japanese government decided to nominate seven prefectures’ cultural events, including Miyako island’s Pantu, for intangible cultural heritage designated by the United Nations Educational, Scientific and Cultural Organization. 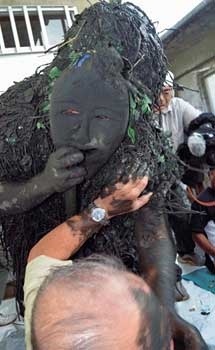 In Miyako’s Pantu, local residents disguised as gods’ messengers go around communities putting mud around in order to remove bad luck. 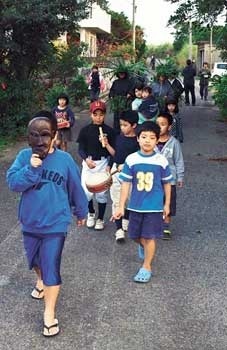 Pantu, the national significant intangible folk cultural asset, will be added to the existing “Toshidon of Koshiki Island” in Kagoshima, which was designated in 2009. The group of events will be nominated for designation as “visiting gods’ event”. Pantu in Miyako is also used to generically refer to “Pantu Punaha” in Hirara Shimajiri as well as “Satiparou” Ueno Nohara in Miyako city. Other cultural events that will be added to the nomination list include “Oga no namahage” in Akita, “Yoshihama-no-suneka” in Iwate, “Yonekawa no mizukaburi” in Miyagi, “Yuza no koshogatsu gyoji” in Yamagata, “Noto no amamehagi” in Ishikawa, and “Mishima no kasedori” in Saga. The government will nominate the events to UNESCO by the end of March, and the events will be examined around November 2017 at the earliest.